Firstly thanks to everyone who was involved in organising this years Manchester MCM comic Expo. Most comic conventions I’ve been to in recent years have been forgivably disorganised by either missing things, opening late or having little to do. This years MCM Expo was pretty much flawless. Even with the worst rain Manchester has seen for a while they made every effort to get people into the convention soon as possible and made sure there was loads to do once we all got in. It was easily the most well organised convention I’ve been to so far. This year was the first year MCM Manchester was run for two days and I’m really glad it was just to help fit everything in. The Saturday opened at 9am to those with early bird tickets and opened on the dot. Compared to last year there were a lot more shops and also a great variety of them. They had everything from Gundams to vintage comics, games and replica props. I was also pleasantly surprised by the prices on most of the gear with a lot of it being cheaper than online prices so in a lot of ways I’ve saved money by going to this years Manchester comic con. One of the best purchases of the weekend would have to be the Power Rangers Green Dragonzord from A1 toys. They stock it as a UK exclusive and had about 400 in stock but they looked to be selling fast. The shopping area also housed a lot of free stuff and of course live Robot Wars throughout the day. Having a good selection of food and drinks on site also helped make the convention a lot more pleasant especially with the weather over the weekend. Guest wise the convention had people to meet throughout the weekend. They did a great job of getting people that most people would know and like to meet. We had Warrik Davis who has been to Manchester comic con a few times and always been great to meet. Unfortunately he couldn’t make the Q and A on the Sunday but he was around all of Saturday meeting people. The convention organisers also managed to get a large portion of the Red Dwarf cast in on the Saturday including Chris Barrie (Rimmer), Robert Llewellyn (Kryten) and Hattie Hayridge (Holly). At one point I thought we would have seen the whole main cast turn up at the show. The most popular guest had to be Vic Mignogna. He was there for both days and did a great job of keeping everyone entertained. His talk on Sunday was also amazing. I’ve met a few voice actors before and always been wowed by their talent. Vic has been a voice actor in about 90% of the anime I’ve watched and I really hope he comes back next year. The comic village gave a lot of independent publishers and artists a chance showcase their work but I think the only thing this convention lacks in is a bit of attention from some of the big publishers like DC, Marvel or even 2000AD. I’m not sure if it’s industry politics or that some comic publishers are put off by the mix of anime and games at a convention but big comic publishers was the only thing it was missing. Cosplay wise the weekend was amazing from start to finish. With the first day being continuous rain I think a lot of people were put off but after standing in line next to a girl in body paint as a ninja turtle really showed the dedication people put into costumes at MCN expos. 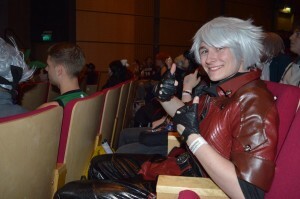 The convention organisers also put on cosplay competitions for both days so nobody missed out on showing off their costumes. 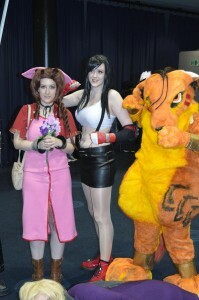 My personal favourite cosplay of the weekend has to be the Final Fantasy VII team. I’ve loved the game for years they had by far the best costumes I’ve seen especially the Tifa. It’s sad that one day the original FFVII might be forgotten but for this weekend it really came to life. The the cosplay show at the end there was also an amazing performance from a Harley Quinn and could have easily played her in a TV show. 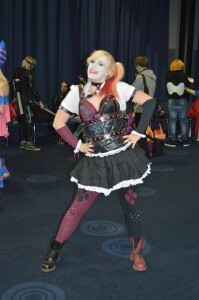 For anyone thinking of starting to cosplay the MCM Manchester Expo is a good place to start. The ratio of those dressed up has to be at least 50% of visitors which made everyone else feel very under dressed. Overall the whole weekend was amazing from the people who put together the most organised convention I’ve been to and all the people who went. I can’t wait for next year but just hope we get better weather. I took too many pictures to upload to the website so like the Facebook Page and the album of over 100 pictures is available to browse through. Buy Early bird tickets to get in early and avoid getting in line for hours. Visit local shops – If you stay in Manchester for the weekend we have a few cool shops within walking distance of the convention including a Forbidden Planet megastore, Travelling Man comics, a Lego shop, Toys R Us along with a few book shops that sell vintage comics. Take a break in the Theatre – MCM put on a few great talks over the weekend which were great for resting up between shopping trips round the halls. Easy travel – The convetion takes place at Manchester Central which has a train station at the back called Manchester Deansgate, it’s a lot closer than Manchester Piccadilly. The Metrolink also has two stops close to the location.